It’s started already. The familiar avalanche of junk mail crammed into our modest mail box. Colourful catalogues telling us how many weeks of buying days left, what to buy for who, what to cook, what to wear and what else we might need to buy. In addition to the retail bombardment is the avalanche of pre-Christmas events and catch ups, sometimes with people we haven’t seen all year, leaving our calendars also bursting at the seams. Is it any wonder we feel a bit overwhelmed? It’s the season to be merry, but is this merrymaking coming at a cost to our own sanity and peace? Are we doing certain things because we feel we ‘should’, or are we living our own Christmas values – focusing our energy, support and spend towards the things most important to us? It’s a question I’ve been pondering lately as I aim to have a simple Christmas that’s focused on celebration without all the stress, preparation and obligation. Last night I was flicking through a catalogue and looking at the array of Christmas pyjamas for kids that were advertised. It struck me as a product that, although cute for present opening photos, is inherently wasteful – they won’t fit the child next year, so unless there’s a younger sibling or a friend or family member to pass them onto, it’s a bit pricey, when a new pair of non-festive pyjamas will garner countless wears for the same price. When those thoughts were running through my head I realised that excess consumption in the name of Christmas doesn’t sit particularly well with me. I had hit on one of my Christmas values. Like so many other ‘traditions’ it’s sometimes easy to get caught up in the hype and feel you need to buy and do certain things to make the day special and make lasting memories. But I want to encourage you to get back in touch with what you really value, not so much about what society at large values, which let’s face it seems to ramp up every year. So, this week have a think about what you want Christmas to mean to you and your family. You might love the social aspect of Christmas and love a full diary, or you might find being so busy completely suffocating. You might love to go crazy with present buying or you might like to keep the present buying simple. You might feel energised about the thought of extended family gatherings or you might be filled with dread. Be honest with yourself! It’s okay to have these feelings. Think of how you want to feel during the festive season and how you can make that possible. If you feel like it, jot a few notes down about what’s most important to you. What makes you uncomfortable about Christmas – is it the financial pressure, the coordinating of family members, food preparation? What changes could you make to help you feel more comfortable? I’m still working on my values list, but I really value having relaxation and downtime around Christmas, I want to buy presents that support smaller businesses and gifts for the boys that encourage outdoor activity, I want to keep our Christmas budget modest and enjoy food that is simple, fresh and tasty. I’d love to hear what your personal Christmas values are. Let me know in the comments below. 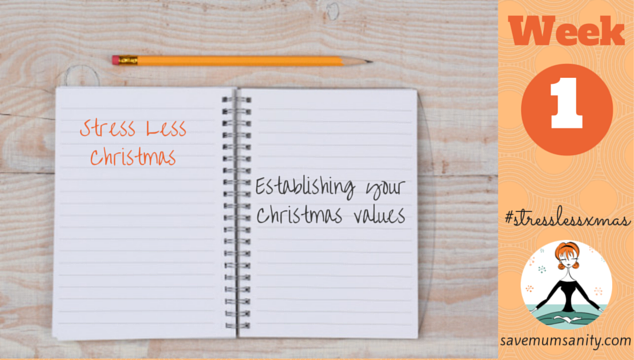 Next week, we’re going to put these values in action with our #stresslessxmas to do list!